When McMaster threatens Council, it threatens all Hamiltonians. This Hamiltonian doesn't like being threatened by people who are asking for a lot of my money. City Council is used to dealing with deadlines, so I have no doubt they will know how to respond to McMaster's seemingly threatening deadline. If they do view it as threatening, then I believe McMaster will have achieved their goal. If, on the other hand, Council views it as another, albeit important, detail in the negotiations, then it is just that - another detail to consider and with which to deal. The remarkable thing for me is that Council has a supposed partner who is relying on the City to cut two cheques and to sign an ancillary deal. One cheque for $20 million for which we have negotiated a zero direct ROI (we own no portion of the resulting asset). Another cheque in the amount of $27 million for rent. And still another signature on a 20-year lease so the third partner can qualify for low rent for two years. They receive the benefit of our longer term commitment. Not to mention the fact that we will cause enormous financial risk to a long-term downtown investor who has been paying taxes for years (The Right House). I don't have a problem with any of this so long as our munificence is acknowledged and is reflected in the behaviours and decisions of our partners. Instead we get strong-armed? Instead we have to be on the receiving end of not-so-veiled threats? If all McMaster was asking for was for some zoning flexibility or just swing space, Council should be jumping up and down trying to accommodate them. But when they're being asked to put the City's name on two cheques and one deal to the tune of $50+ million of our money, I recommend not even to think about blinking. Let's agree to not be fiscally sucker-punched. Like Council, I want Mac to be part of our downtown, just as I want our Board of Education to stay downtown. Partners are permitted to get frustrated through the dealmaking process because it's almost always messy. But when they cross the line and effectively threaten in public (Council Chambers and Trustee Chambers), and in the media (Spectator), while they have their hand out for a big chunk of our money, Council really has to step back, take a breath and evaluate the behaviours of its future partners. If the partnership is founded on this basis, how do we think it will develop into the future? Does anyone think the pattern of behaviour is likely to change? Not in my experience. Negotiate as equals, not as desperate and naive participants. Common goals. Different methods of getting there. Our money. Council's decision. It's time to get into a room together with both potential partners. Face time is what makes deals work. Correspondence, presentations, delegations, comments, reports are all part of the process, but sitting in a room together beats all of them. Our financial contribution is significant. If we lose the Board and its employees downtown, and gain the medical clinic and its employees downtown, the outcome may be more symbolic than economic, especially when $50 million of our money is required to make this happen. By way of comparison, just imagine the economic spinoff from a $10-20 million investment by the City of Hamilton in a true joint venture (ie. where we own a piece of the asset) to revitalize the Royal Connaught: jobs, taxes, tourism, conventions, citizens using a downtown facility, people living and shopping in the core in apartments and condos. You get the idea. McMaster references their Plan B. We need a Plan B too and unlike McMaster, I recommend Council declare it only if its "partners" make that absolutely necessary. Otherwise, we run the risk of appearing to be less than honourable negotiators. Remember, when you threaten Council, you threaten all Hamiltonians. This Hamiltonian doesn't like being threatened by people who are asking for a lot of my money. Editor's Note: this essay is adapted from a letter to Council. Graham Crawford was raised in Hamilton, moving to Toronto in 1980 where he spent 25 years as the owner of a successful management consulting firm that he sold in 2000. He retired and moved back to Hamilton in 2005 and became involved in heritage and neighbourhood issues. He opened Hamilton HIStory + HERitage on James North in 2007, a multi-media exhibition space (aka a storefront museum) celebrating the lives of the men and women who have helped to shape the City of Hamilton. Graham: First off, thanks very much for your efforts and continuing focus on these developments. If we could somehow get you into the room as facilitator with all three parties, we'd surely have a shot at a win/win/win outcome. But to your point regarding the strong-arm tactics practiced by the university: the only reason they're trying it on is because they've seen it work. I know it's going back a long time, but we had a little controversy in the distant past over siting of a sports stadium. A minor-league sports franchise with no real alternatives threatened to take its oblong spheroid ball and go somewhere else but nowhere in particular. Council panicked and caved. So now we continue to pay a further price, as other prospective partners employ threats and ultimata as bargaining methods of choice. Burlington had an arrangement for a downtown health centre from McMaster back in the day. That panned out pretty well, right? 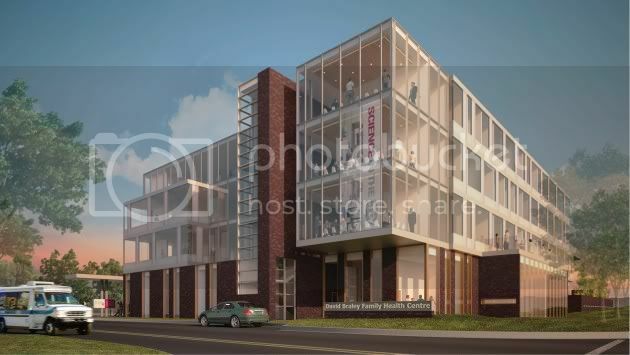 The health centre is still going ahead - on Joe Brant's site. Hope that Burlingtongets it ... Hamilton City Conciel im sick and tierd with them ! We're close to seeing this deal fall through and good. BTW where is Mac's decision matrix on possible locations for the Health Campus? Why does it have to be the BoEd site or MIP? Did they explore anywhere else downtown? Let's see the results of their decision process. David Braley donated his money for Mac to use on a DOWNTOWN development, that's what he asked for. Mac is just as bad as the Board, maybe worse, the Board at least made an attempt to justify the mountain. Mac is threatening us and then saying well then we'll just build at MIP. Maybe there's a spot along the QEW near your MBA school. Doesn't it feel weird to be nodding along to statements like this? I mean, all three stakeholders in this mess are taxpayer funded and nominally accountable to the public, yet we still have to hope and pray that they do the right thing and work together in the public interest. On the bright side, though, the planets literally aligned this past week, so maybe that's a good sign? "If you gonna be a square, You ain't a gonna go nowhere..."
Learn how to mambo... may have been a better option here with the swing space, but instead we have painted ourselves into a corner yet once again with our propensity to "grandstand". New building to house a primary healthcare teaching clinic and the Department of Family Medicine’s education, research and administrative functions. 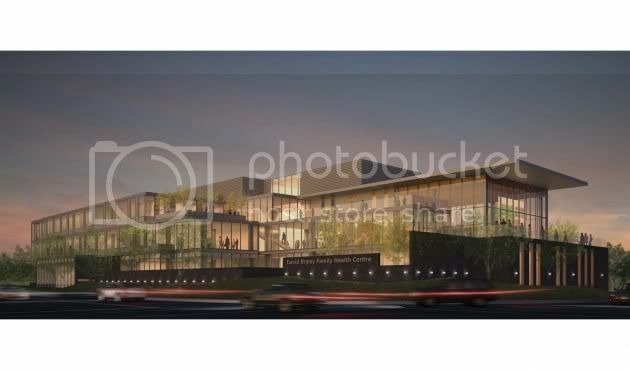 Located on a high profile corner site at the McMaster Innovation Park, this building is intended as flagship healthcare facility and a high quality workplace. Mac is just doing business as any corporate entity would. It hedges the odds. There are not playing checkmate here. They don't need the core to build their medical centre. The core needs them. However much we want to dis-believe, Mac's timeline is real. They risk loosing their financial commitment, much as the City recently lost out on its two delayed projects. Mac's Plan B is distinct and real. The city has no Plan B. It is time to smarten up and do what it take to fix our Tooney Tuesday attitude in order to avoid jeopardizing yet another opportunity we have in the core. The new task force will not come up with any new location in the core that has not already been analyzed to death. The unproductive grandstanding on the part of Clr. Jason Farr and Andrea Horwath will be part of their political legacy. Both of them clearly knew what the low down on the BoEd move was over 2008-2011 - yet they waited till the last minute to swarm the deal. Why? Instead of slagging the staff, some of our Councillor's would do the city a big favour by making an effort to understand that the city does not stand to loose a single penny in the swing space deal which was presented to them yesterday. In fact if anything it showed the private sector that the city staff had finally come up to speed with the business world in fast-tracking economic growth and facilitating negotiations. After the Public Health vacates the "Right House" it only stands to reinvent itself financially in a far more stronger way, by availing itself of the residential conversion loan to convert the very large already restored commercial building into the best downtown residential rental/condo property in the core. It's present business does empty the core past working hours. The Gore stands to gain as well as the owners of Right House with this move. The Filmwork Lofts around the corner was restored and sold out within six months. The Councillor's need to promote the Public Health move from Right House as the single greatest opportunity for bringing in a sizable live/work residential component into a historic property in the heart of Gore Park. There is indeed a win-win-win for all in this. The glass as always stands half-full for the core - depending on how you look at things. So, if the threat is real, then we must be prepared to live with the consequences, for which all parties will be responsible. Mac builds a new, smaller, labelled, family medical centre at the MIP (350 jobs + visitors). The Board stays downtown (350 jobs + visitors) and renovates it's building for between $12-$17 million, half the cost of moving and building on the mountain at the Crestwood site. The Board sells the severed parking lot to a developer and uses those funds to help renovate, and possibly expand, the Education Centre. The Board sells the Crestwood site to a residential developer and uses those funds to help renovate, and possibly expand, the Education Centre. The Board parks its maintenance vehicles, etc. at a site it already owns and renovates as necessary. Construction jobs for a two year period at MIP and at the Education Centre. The City of Hamilton saves $20 million ($10 of which can be left in the Future Fund). The City of Hamilton negotiates its Public Health Department space requirements with selected landlords who pay taxes. Although I do not want this as the outcome, I am very much prepared to live with these consequences. Mac builds a new facility as big as its original need-based program demanded and got funded for - at MIP. The City still remains a strategic funding partner with Mac's Family Health centre, as it services the health needs of the entire city. The Board of Education sells 100 Main street to a private developer as it has exhausted the first dibs list, and builds a new Education centre at Crestwood - where it achieves a 30% operational efficiency via its planned consolidation. The private developer exercises the demolition permit it has received as part of the purchase agreement to promptly level the lot and put cement blocks on Main and Bay, while patiently awaiting the rejuvenation of the core. The empty overgrown lot at 100 Main impacts the pre-sales of the Federal building project and now has been scaled back. Patients from all over the city now commute to MIP via an already overloaded HSR service to Longwood for family care. And patients who drive, jam up the Longwood/Main corner of Westdale. Right House consolidates the public health offices and continues to empty out at 4.30 pm every workday and holidays, while Gore Park continue to struggle. A new minimum-wage call center comes back to the Thompson building, and the mall retailers continue to suffer from flat sales. A new movie called Butterfly effect is finally scheduled to be shot on location in the downtown core. See, now you have gone and made me finish the half-full glass that I had kept aside for so long :) Coffee sometime? Given that we are all projecting here, anything is possible of course, but I would question #1 only on the point of Mac's needs assessment. They don't need a building that is as big as the one the parties are discussing at Main and Bay, so I think the building could very well be smaller. Not sure why the city should have to co-habitate with Mac if Mac pulls out of the negotiations. Needless to say, I see the strategic and social benefits of them co-habitating, but it's not a requirement. It would be shame if they couldn't reach agreement though. The 30% operational efficiency has been stated, but so have a lot of things, so I'm not putting as much faith in that number as I once did. I can't say it's wrong, but nor can I say it's correct. Besides, other than the maintenance vehicles being consolidated, even the Board's revised analysis numbers show that the assessment was weighted rather heavily on staff accessibility (highway access) and building visibility. Even so, Crestwood barely scratched out a win. Convenience for staff is worth consideration, but so too is accessibility for parents and children from all parts of the city. I understand buses also run on the mountain, but it might be more convenient for people who are less likely to have access to automobiles to have easier access to public transit. I agree with #6.I think it's a good point, but apparently this is not a huge issue for Mac given their stated Plan B. 7 is the problem we face with many office buildings in the core, no matter on which corner they sit. I think your idea of the Right House being prime for condo conversion is well taken. So too is my point about investing in the Royal Connaught rather than the Mac Health Clinic. Building a smaller building means they won't need our money over at MIP, so it potentially frees up some committed capital. 8 is indeed a "half empty" comment. There is so much empty office space downtown that your point could be made for all of that space. I'd like to think the more we do downtown, the more attractive it will be for higher wage job opportunities. As I said, I want Mac and the Board downtown, so we do agree that both could have a very positive impact on daily commerce. We're both guessing, which is fine with me. This isn't science, that's for sure. But it does help to expand our respective and collective perspectives. What I want to emphasize is that consequences are felt by all three parties. Clearly, given that fact, it's in their best interests to work this thing out. I know we share that view, even if some of the details are not identical. #1 seems possible. Aside from the "mercy campus" across from the Sopinka, they've behaved like vampires who believe that Dundurn Street is a line of salt. Surely we don't have to debate the nonsensical point that the Board wants to have its maintenance vehicles as part of its consolidated operations? It's a red herring. One of many tossed out by those who have already packed their bags. No fiscally-minded corporation, including the Liberal provincial government, thinks that paying to include maintenance vehicles in an urban core is a reasonable idea. i've never met one. Unless of course, one of the senior managers feels a need to go down to the basement and look at all of the vehicles the corporation is paying to lease. Presumably, those vehicles should be out doing maintenance in any case. There is no strategic advantage whatsoever in having them underneath, or beside for that matter, a downtown building. Even architects might agree that it's possible to expand the Eduction Centre, whether up or out. It is a reinforced concrete building after all, which has a curtain wall on all four sides, including the back one that faces onto a parking lot. You know, like they did with the Sopinka Courthouse and the old Main Library (now Family Court). No need to get personal - again. Let's just focus on dialogue and engagement. We can disagree, but we don't need to use names when we do. So do you belong to your local neighbourhood association in Stoney Creek? Or do you just write blog after blog about NA's and how great they are? I don't think I insulted you, did I? I apologize for assuming you live in Stoney Creek, mystoneycreek. Or assuming you were active in a neighbourhood association and/or efforts to start one, after reading at least a dozen comments/articles from you touting the merits of Neighbourhood Associations. MY BAD. I don't understand why you're offended- at least to the extent that you're calling me an "asshat". And comments like mine are what's wrong with discussion in Hamilton? I would never insult your hat. In fact, I think tin foil is rather fetching on you. Calm down a minute and explain how you're actively practicing what you preach. The lack of response is somewhat telling here. Do you have experience with neighbourhood organizations? In what way? Are you involved with a local association in whatever part of town you call home? Sorry, maybe I'm missing something, but aren't you massively conflating here? "Conflation to me has always brought to mind the therapist's mantra for couples when arguing: 'Stick to one issue.' To not bring into the 'discussion' other problems, other bones-of-contention, other grievances." And this kind of comment is just plain old frightening. "Earlier this year the McMaster project received a $10 million city and regional funding contribution towards the McMaster University DeGroote Centre of Advanced Management Studies and Family Medical Health Centre. Both the city and region contributed $5 million." Dig the "Cycling Master Plan study" sidebar. Can someone tell me about the Yale/City lawsuit? What are they sueing over? wow..now they are suggesting West Harbour again? Get real. I love the Spec quote about how the Crestwood plan fits at Barton/Tiffany. Yea, because we went through all this agony to finally open up these lands for development so the school board could pave over it with a parking lot. No thanks. Am I alone in thinking that for 99.99% of Hamiltonians, the BoE is a dead building even if it remains standing? The past month seems to have intoduced the building to more people than gave it any thought for the 44 years preceding. It's so disconnected from city life that its only significant human face is probably that of wage negotiation picket lines. Is that an architectural failure, an organizational failure, or both? I agree that the unfortunate setback popular at the time of construction has the functional effect of distancing the building from the street, which would be a greater loss in other cities where streets are vital public spaces, however I believe that could be mitigated by both an intelligent redesign of the plaza, and by the conversion of Main St to the kind of public space it should be - the city and the board meeting halfway as it were. I betray my childlessness. Bias. And I do admire the building for its elegant bones. But I guess that's what I'm getting at, the plaza setback. City Hall has some of the same dynamic at work, but it's glassy enough that you have a sense that there are humans within. Probably one of the many casualties of the erratic Civic Square development revisions. The same argument can be made for any building that people don't frequent - Copps, HECFI, the Central Public Library, the Standard Life Building, Lister Block, Right House, Hunter Street GO Station (for those who drive everywhere), City Hall, the downtown Farmer's Market (for those who don't frequent it), the old Bank of Montreal building on the corner of Main and James, the Unified Family Courthouse, etc, etc..
A building is never thought of by people who don't use it or have need to go there. I don't see why you think the BoE stands out as unique in this sense. I think it's a nearly universal truth. While I agree that it is a strong arm tactic and that the BoE building should be saved, I also know how much work has been invested from the Mac side. This isn't a purely admin building with cookie cutter offices - there has been enormous time and planning invested because of the short time line. While the message is strong, it's probably tied to the frustration of seeing this possibly fail and having to start again. I personally thought this was all slated for MIP so it could also be that Mac had to scuttle original plans for the BoE site. Then just build it behind the BoE building on the parking lot at Bay and King. Graham, you dont singlehandedly drive this latest push, but I think you are to be commended for your insight and awareness. Even taking the high road when others seek to attack and discredit your efforts. What has turned this latest tide of opinion? It seemed a done deal and we were planning it's wake. Like City Hall and the marble. Now things seem different. I wonder who or what gets the credit. I wonder who or what gets the credit. McMaster has contributed millions upon millions of dollars to Hamilton's economy in so many ways including the money out of town students spend while they are here, money that wouldn't be spent here otherwise in all liklihood. I hope Mr. Crawford understands that. Also, McMaster is rather unlike other universities in that while it has a large number of students who move to Hamilton to study (it's not basically a computer school is what I'm getting at) very few of the students actually stay and work in Hamilton. McMaster has realized this, and are attempting to change that too. The shawarma precinct is waiting with bated breath. Did the province rent the city a wrecking ball? "...in keeping with this complicated three-way deal, the pot has suddenly been sweetened at the 11th hour. Among other things, staff is expected to tell council that the city’s financial contribution is about $20 million less than originally touted. Thanks to provincial subsidies, the city’s total financial contribution is now pegged around $26.1 million instead of the $47 million or so that’s been bandied around for months. The bulk of the $26.1 million consists of a $20-million capital grant from the city to help Mac build the facility and acquire the property from the school board. The other $6.1 million is the cost of public health services leasing space within the Mac campus over 30 years — down from an estimated $24.5 million to $27 million. Robert Rossini, general manager of finance, attributes the tumbling to about $18.4 million in provincial subsidies to help relocate and house public health." These subsidies exist for Public Health no matter where they locate- it's a standard 75/25 cost sharing arrangement. If the Mac project doesn't happen, the $18.4 Million would still go towards Public Health's eventual accommodation. It's unfortunate that this wasn't clarified months ago when Council was first considering its commitment to the deal. The timing is very odd- staff decides to clarify this at the 11th hour? It's not "sweetening the pot"- we own both the pot and the sweetener in this case. Perhaps what you're getting at with the "pot/sweetener" comment. It's also hard to view a massive infusion of public money into downtown as a departure from the status quo.